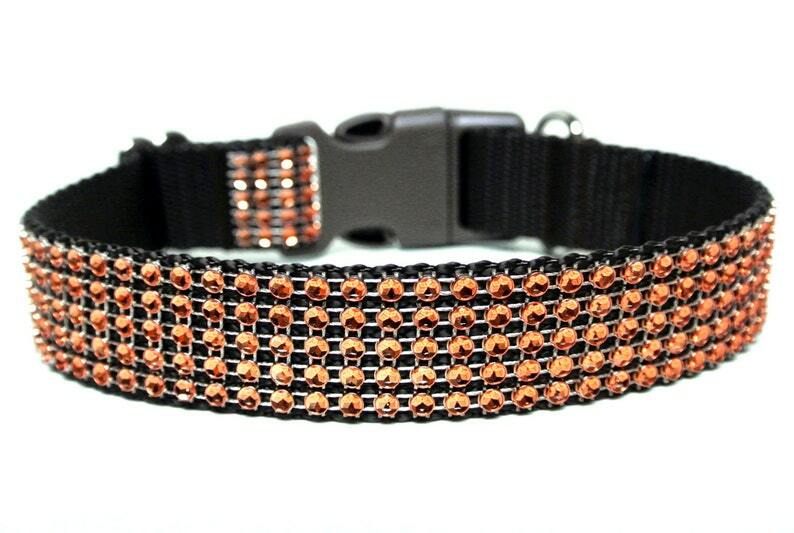 Beautiful and luxurious fall rhinestone dog collar! Made with 5 fabulous layers of a orange rhinestone design that actually holds no stones but shines like diamonds. This rhinestone dog collar has brown nylon webbing and a matching brown buckle. This is a perfect collar if you love the design of rhinestone but are afraid of loosing them. **please notes this orange is not a bright orange, more like a copper orange. This listing is for a rhinestone dog collar 1" perfect for medium to large breed dogs. Please indicate which size you would like for your orange dog collar...note that all sizes in this listing have 1" hardware.